This blog will serve as another resource for parents for up-to-date information on the different aspects of their child's growth and development. Before you know it 1 year has passed and you are celebrating your baby's first birthday. 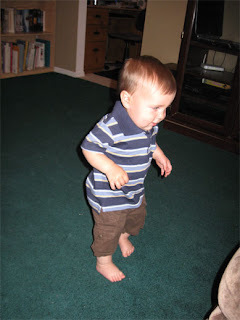 He will be starting to walk all over the place. So beware, make sure the surroundings are safe for this curious little one. Most babies can pull to a stand and at least stand alone at this time. They start to finger feed themselves and drink from a cup. The are able to grab on to small objects with a precise pincer grasp. They start playing pat-a-cake and peek-a-boo. They point to desired objects. They can say "mama" or "Dada" specifically ,h! how sweet that sounds. They say 1-2 words by this time. I am a pediatrician, a wife, a mother of four active boys, a friend, a cook, a teacher, a student for life and now a blogger.